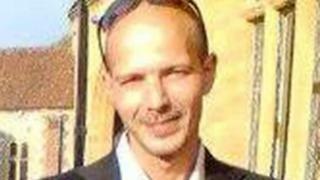 A man who was exposed to the nerve agent Novichok has regained consciousness after a "small but significant improvement", Salisbury District Hospital has said. Dawn Sturgess, 44, who was also exposed to the nerve agent, died on Sunday. Her family have described her as "a gentle soul who was generous to a fault". Police are investigating a possible link to the case of Russians Sergei and Yulia Skripal - who were poisoned with the same substance in nearby Salisbury. They both then fell ill on Saturday 30 June, and Ms Sturgess died eight days later. She had two sons, aged 19 and 23, and an 11-year-old daughter. Wiltshire Police said the public "should not be alarmed by this," adding: "Those involved have the training and expertise to safely remove the vehicle." The BBC understands Mr Rowley's flat is regarded as the key location in the search. A team wearing protective clothing is combing the small flat, working in 30-minute shifts because of the heat. Public Health England also offered advice for people who may have visited one of five areas identified by police. Those locations are Muggleton Road, Boots pharmacy, and the Baptist church in Amesbury, and John Baker House and Queen Elizabeth Gardens in Salisbury. Anyone who was there between 22:00 BST on 29 June and 18:30 on 30 June should continue to follow advice, including washing their clothes in a washing machine.